AJA has developed a simpler way to change targets. We replaced the traditional Hex head screws with Torx head screws and replaced the counterbore holes with key slot holes. ​What does this mean? Instead of having to completely remove the screws to release the clamping ring you only have to back them off and turn to release. The Clamping Ring is available for 2, 3 & 4 inch AJA Sputtering Sources including Non-Magnetic - A300, ST & A3CV Sources. 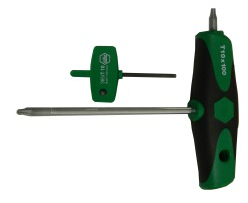 Kits include: Clamping Ring, Torx Head Driver & Torx Head Screws. ​For our most popular sources we have also switched the rotary shutter and ground shield assembly to use the same size Torx head screws. What could be simplier? One tool does it all! Not sure if it will work with your source. We are here to help. Click here to send us an email.